Producer: Target Games: Softbound Rulebook. 208pp. Know you then oh King of a time ages gone by and in a world much darker than that you now rule. Where death and destruction are common place and the rule of the Sword is as a god unto the land. Know you now of a time before time, an age of Dark Fantasy, an age of Chronopia. The latest release from Target Games and the first full and new rules system since the design studio moved into its new local overlooking the Firth of Forth in Leith, Edinburgh on the east coast of Scotland. Chronopia has been a long time in the coming and has perhaps caused more than its fair share of controversy on the newsgroups and among gamers the world over. Well after waiting almost a year it´s finally arrived and was the wait worth it? Well let´s take a looksee. Chronopia is a skirmish based fantasy combat system that utilises a very similar game´s mechanics to that of Target´s other skirmish game Warzone. Like Warzone the rules are fast and easy to pick up and are well laid out in most cases. Also like Warzone a few errors crept in just before printing and already errata is floating around for some of the troop types and rules. In Chronopia you take the part of a leader of a group of Warbands from anyone of the four races included in the system. Warbands function the same as Squads in Warzone, and will consist of between 4-8 men in most cases, but sometimes can go has high as 12 men. Comparisons to Games Workshops Warhammer Fantasy were bound to be made and I for one was a little surprised when I read the background for the system for the first time. To be completely honest I too was expecting a Warhammer clone, but as I read through the very lengthy background of the world of Chronopia (the planet the game is set on!) I found all ideas of a Warhammer rip-off going out of my head completely. The history in Chronopia is very intense with hundreds of humans dying on many occasions to overwhelming forces and the inevitable rise of evil to destroy the world. 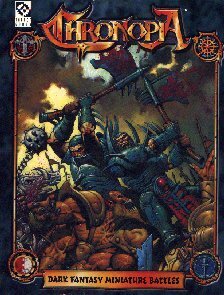 The background has been accused by many recently of being far too long at over 55 pages, and in parts it does read like a Robert E Howard or Michael Moorcock novel, but to be completely fair unlike Warhammer which has had over 14 years of history to build upon, Chronopia is the new kid on the block. Speaking of Moorcock. The idea of the Eternal Champion is brought home hard and fast in Chronopia. The One King, leader of the Firstborn (Humans) is the very model of a Moorcockian character and wouldn´t be out of place in one of the writers novels. Rising up from out of nowhere and becoming the leader of the Firstborn, the One King is all that stands between the other races and the encroaching minions of the Devout (Chaos types). Having been slain at the hands of an evil power hungry Elf Duke, the one king in true heroic fashion returns in the hour of greatest need and unites all the Firstborn once again to take their rightful place among the leaders of the world. Similarities between the One King and Jesus Christ or King Arthur will also no doubt be made (rising from the dead, the killing of the firstborn male child, returning in the hour of greatest need!) and perhaps its intended perhaps not. But rest assured that the world will be a safer place now that the One King is back in town. As for the rules! Unlike Warzone, where you have the luxury of being able to pick your opponents off at a distance. Chronopia is very much in the "Up Close and Personal" vein. Close combat is handled the same way as in Warzone (as is shooting for that matter) and the only main difference in the familiar Warzone stat line is the inclusion of the DEF modifier, which makes a tough character harder to hit in battle. Joining with the Firstborn on the world of Chronopia are the Elves, Blackbloods, Dwarves, and the Devout (with the Stygian due out at the end of January 98!). This is were Chronopia really differs from Warhammer and in my own opinion, comes out on top. Elves are not the fire and retire wimps that most modern systems and novels portray them as. Intrigue and backstabbing seem to run rife in the Elven courts and they are very dark and sombre. Dwarves are also not the usual ´sitting in my mine, making weapons, drinking ale´ stereotypes that are so much Tolkinesque (or AD&D for that matter) the Dwarves in Chronopia are animal worshipping creatures that are very warlike and as with most of the races in Chronopia a heck of a lot darker. After killing their gods, the Dwarves have now taken to trying to survive in a very hostile world, with feuds being commonplace and the Dragon clan being slaves to the Elves and the Jackal clan now belonging to the evil Devout. But by far the greatest shock and I feel improvement over other systems is the Blackbloods. Orcs have often had a bad rap in the past for being thick or stupid or very insane. 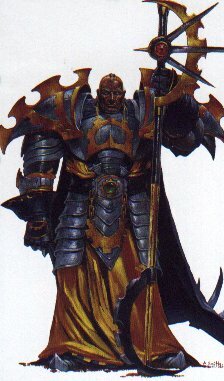 Here the Blackbloods are one of the oldest races in the world of Chronopia and believe me one of the hardest. Unlike Orcs in fantasy games such as Blizzards Warcraft, these Blackbloods are very intelligent with good weapons, troops and tactics and one of the biggest empires in the game. Comprising of Orcs, Goblins, Trolls and Ogres they are by far my own favourite in the system. Looking as if they have come right out of an "Arabian Nights" tale, a very Eastern element is detectable at once in the Blackbloods. Ruled by an Ogre emperor with a Vizier as an aide, and most of the Blackbloods sport very neat looking Saracen like beards or moustaches. Magic had to crop up in a fantasy game and of course Chronopia has its very own slant on the use of the forces of magic. Instead of going for the basics such as elemental magic, the Chronopian magic systems are very different from each other. Elves gain magic by eating strange Lotus flowers that grow in remote parts of the world, and allow them to channel mystical like energies. Dwarves and Blackbloods don´t have magic as such. The Blackbloods do however have the Alchemists who can use potions to give magical effects and the Dwarves have Keepers who can literally turn themselves into the gods they worship and cause a tremendous amount of damage. Devout have the usual spells that are associated with Chaos, such as raising the dead on battlefields, but it is the humans who have the strangest spells of all. Chronomancers use the ability to look in time itself and foresee outcomes of battles and determine weak spots in the enemies forces and their own. The One King is also blessed with this strange ability and time holds no court over him. One of the things that regular players of Warzone may find a little hard to get used to at first is the number of actions that each troop type has. The norm in Warzone is 4, here in Chronopia its down to 2. This means that a Warband once activated can move twice or fire twice in its turn, and given that the average movement is very low on some of the troops it can slow the game down. Bow fire is very deadly in Chronopia and perhaps the Bowmen should be a little higher to purchase to take this into account, but Bowmen are somewhat limited in the range of the weapons they are using. Devout Necromancer So how does the game play? Well! If you´re new to Targets systems, you will find it very easy to pick up, but if you´re a veteran then please bear with me for a few moments. Unlike Warhammer and most other systems Chronopia uses small units or Warbands of miniatures instead of vast armies that can be very costly to buy and take forever to paint. The system only uses a D20 and within a few moments of reading the rules you can be playing the game . Each Warband as a set number of Actions that all its members can use, in the usual case 2 for a rank and file model 3+ for special troops and leaders. The Actions allow the player to decide just what she/he will do with that figure in the turn, whether you will move, charge or fire or engage a model in close combat, each model in the Warband may do as they wish as long as they don´t go out of Command distance but its best to keep them all together. Players set up their Warbands on the table top as per a normal fantasy game, and then roll for initiative. The winner then activates one of his Warbands, and uses all of its actions, then the play is passed onto the next player and so on until all the Warbands on the table have been activated and then the process starts again. This allows multiple players to take part in the game, and can take a while to get used to if unfamiliar with Warzone, but once you do its hard to think of using another system. One thing that you will notice in Chronopia is the lack of Cavalry and other mounted troops. They are there but not in the same numbers say as in Warhammer Fantasy. All mounted troops are Individuals and can only be bought when you buy so many other troop types, this stops the players from having to many hard troops on the battlefield and Cavalry from dominating the game. That said mounted troops are a must have in your force so I would suggest that you take as many as you can field (normal is one for every Warband! ), they have a 360 degree fire arc and can be very deadly if used correctly. The actual mechanics of the system are very simple and easy to use and not to overly complex to slow game play down. One of my gripes with the system though is the lack of Heroes and Specialist Characters! In a system with a background so rich and deep to wade through, I thought that the game would have a lot of heroes to lead the forces in battle, but look as hard as you can you wont find any yet and there wont be any in Land of Two Rivers either. The first characters should be in Chronicles (Targets In-House Magazine) 13 or 14, but given the delays that constantly seem to plague the magazine we will have quite a wait on hand. The layout for Chronopia is excellent throughout and is lavishly illustrated by top fantasy artist Adrian Smith, and a whole hosts of other talents, whose work really brings the game to life. Army lists are provided for all the races, with the Jackal clan and the Stygian being covered in the first supplement "Land of Two Rivers", due out soon. Packed with lots and lots of excellently sculpted miniatures from the likes of Roy Eastland, Tim Prow and Neil MacKenzie and newcomer Pete Flannery (hi Pete! ), all painted superbly at the very talented hands of Mark McNaught, Jackie Prow and the ever excellent Phil "Mr Nice Guy" Lewis. Dwarven Vulture Clan Warrior Chronopia isn´t without its flaws and errors though and hopefully these mistakes (all be it a few of them) will be rectified in upcoming releases. As for value for money! Well the basic system and two forces should work out cheaper than Warhammer, and that´s including a few Warbands for each player. Like Warzone before it, one of the real gems in this games crown is the fact that you can play multi player games with no problems at all. Of course it will be likened to Warhammer, but isn´t that like saying that the latest Clive Barker or Shaun Hutson novel will be akin to the latest best seller from Stephen King? Judge for yourself and I am sure that you wont be sorry.